It's Photo Meme Friday! I fun bloggy-thingy I have wanted to do for a while so here goes! AX and adventures in photo-editing! Don't adjust your screen, this is NOT trick-photography! As track season starts I happened to be browsing through photos from last season and found the above. This neat piece of artwork sits outside the Libby High School in Libby, Montana. We were there to spectate at a track meet. I couldn't resist snapping a shot of my three youngest in front of this colossal apparatus that I imagine Paul Bunion wielded at one time! Join me in Photo Meme Friday! 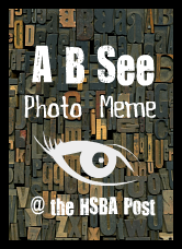 Link up in a message bellow and visit the HSBA website for more details!